Not five minutes after the Affordable Care Act (ACA) was signed into law, in March 2010, Virginia’s attorney general was suing to stop it. And yet, the ACA rolled out, in infamously bumpy fashion, and rolled on, fought and defended at every turn—despite President Obama’s claim, in 2014, that its proponents and opponents could finally “stop fighting old political battles that keep us gridlocked.” But not only would the battles not stop, as Obamacare Wars makes acutely clear, they spread from Washington, DC, to a variety of new arenas. The first thorough account of the implementation of the ACA, this book reveals the fissures the act exposed in the American federal system. 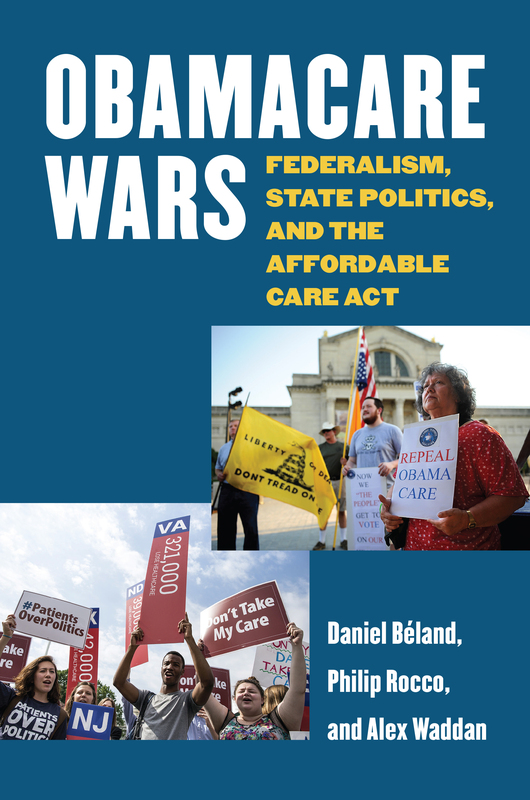 Obamacare Wars shows how the law’s intergovernmental structure, which entails the participation of both the federal government and the states, has deeply shaped the politics of implementation. Focusing on the creation of insurance exchanges, the expansion of Medicaid, and execution of regulatory reforms, Daniel Béland, Philip Rocco, and Alex Waddan examine how opponents of the ACA fought back against its implementation. They also explain why opponents of the law were successful in some efforts and not in others—and not necessarily in a seemingly predictable red vs. blue pattern. Their work identifies the role of policy legacies, institutional fragmentation, and public sentiments in each instance as states grappled with new institutions, as in the case of the exchanges, or existing structures, in Medicaid and regulatory reform. Looking broadly at national trends and specifically at the experience of individual states, Obamacare Wars brings much-needed clarity to highly controversial but little-understood aspects of the Affordable Care Act’s odyssey, with implications for how we understand the future trajectory of health reform, as well as the multiple forms of federalism in American politics. Philip Rocco is a postdoctoral associate at the Health Policy Institute, University of Pittsburgh Schools of Health Sciences. Alex Waddan is senior lecturer in American politics at the University of Leicester.